This is my last non-dressmaking related Christmas present to share after my cushion and my embroidery, and also the most time-consuming! When I was little, about 7 years old I believe, I started doing very simple crossstitch - the kind where each cross is about 0.5 x 0.5cm. The not-particularly-good-and-very-childish kind. Anyway, I made a comb case for my grandpa with a 'G' on the front. Roughly 7 years later, it has completely fallen apart (actually it stated to fall apart before then, but I wanted to replace it with something lovely rather than something quickly made... and I hadn't gotten round to it!). So, for Christmas, I made my Grandpa a comb case. On a side note, this isn't the first present I have made for my Grandpa replacing one I made years ago! 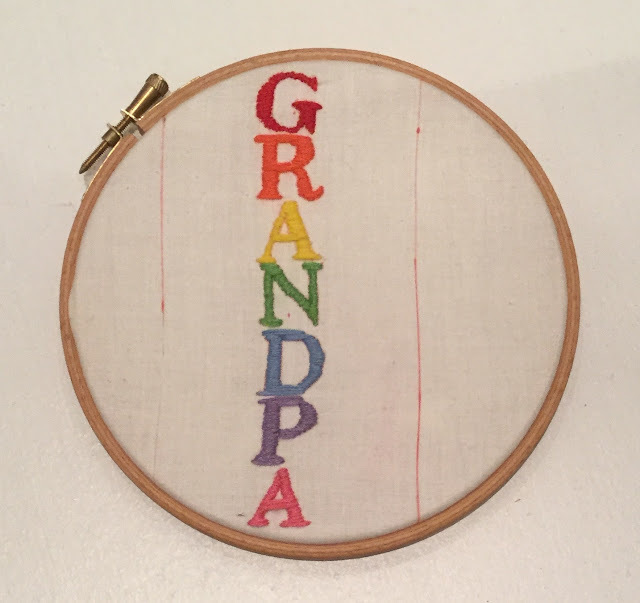 Much like my free-motion embroidery, this was very much a learn as you go project. I have done some embroidery before, but never on this scale or using a satin stitch. However, after watching a couple of YouTube videos on it, it appeared relatively easy and I gave it a go. I love it! I found the process quite easy to get to grips with, and although the first couple of letters took a long time, I sped up a lot towards the end. I used the full six strands of embroidery thread at once, and traced my letters using an iron-off pen. I did decided to go for a rainbow effect, which does seem slightly crazy, but I like it! Once I'd stitched the letters, I sewed them into a rectangular pouch, which was extremely quick to do. I lined it fully, and included a drawstring at the top for purposes of voyage etc. I really loved making this, it was absolutely sewn with love, and is both a practical and pretty present. The receiver was very happy. I'm also pleased to have learnt a new skill, I really enjoyed embroidering and can imagine many more projects with a touch of embroidery in the future. The case has been put to use, and you'll be pleased to know that the old one has been kept too, I look forward to comparing both cases in many years time! That is beautiful and such a thoughtful gift! I can tell you put your heart into everything and your family is so blessed to have such a delightful young lady to share her talents with them. 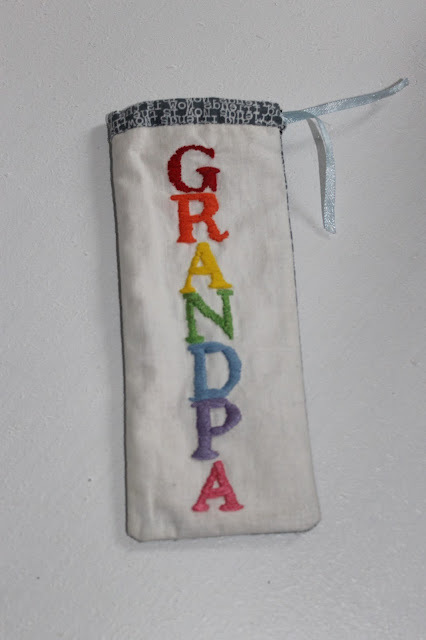 I bet your Grandpa loves his hand-embroidered comb bag! I really like the rainbow satin stitch!